A little less than a year ago, Michigan became the 24th state to enact right-to-work legislation, a development that has been closely associated with the temperature of Hades dropping. Since then, right-to-work supporters have sought to enact similar legislation throughout the United States. Even here in the Northwest. In Oregon, the Public Employee Choice Act would provide right-to-work protections to public employees. With the Boeing’s machinists recent rejection of a new contract and the company’s drift toward more business-friendly states, there has been some speculation that the state of Washington may consider right-to-work legislation in order to hang on to key employers. Right-to-work policies liberalize labor market conditions by loosening some of the most restrictive features of labor legislation enacted during the Great Depression. In 1935, at the depths of the Great Depression job losses, Congress passed the National Labor Relations Act (also known as the Wagner Act). This act permitted closed union shops which require employees to join a union and/or pay union dues as a condition of employment. The widespread impact of coal miner strikes through the late 1940s led some to conclude that the Wagner Act had conferred too much power on organized labor. The Taft-Hartley Act — enacted in 1947 over President Truman’s veto — modified the impact of the Wagner Act by affirming the right of states to prohibit certain union shop restrictions enabled by the Wagner Act. Specifically, Taft-Hartley indicates that states can pass laws that prohibit unions and employers from making union membership or the payment of union dues a condition of employment. These state statutes are referred to as “right-to-work” laws because they give employees the right to work without the being forced to join a union or handover a portion of their paychecks to unions in the form of dues or fees. Right-to-work has gained attention in the wake of the past recession because such laws can be a key component of a pro-investment and pro-employment package that encourages firms to locate and expand in a state. Indeed, a large body of research has found that as a group, right-to-work states have enjoyed more rapid employment growth, better job preservation, and faster recoveries from recession than states without right-to-work laws in place. 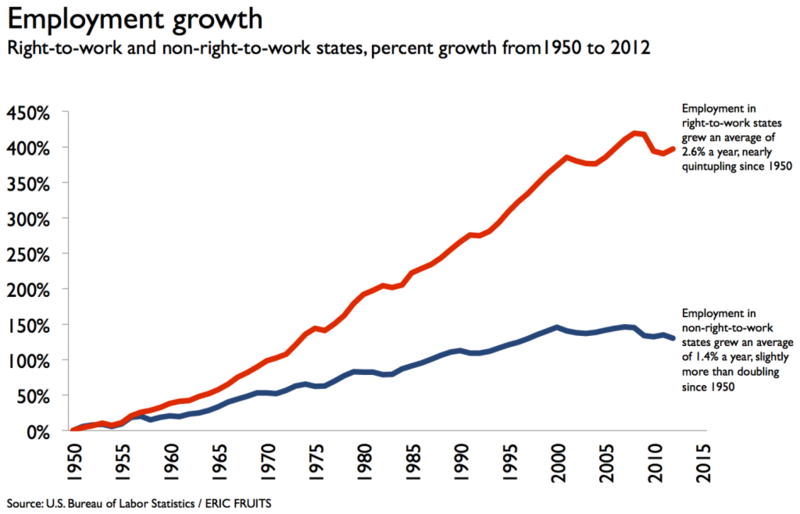 For example, the figure below shows that since 1950, states with right-to-work laws have seen their employment grow at roughly double the rate of non-right-to-work states. While right-to-work laws can be a key component of a pro-investment and pro-employment package that encourages firms to locate and expand in a state, it would not be fair to conclude that all the employment gains can be assigned to right-to-work. Statistical analysis can account for these other factors and separate out the relationship between right-to-work laws and employment growth. 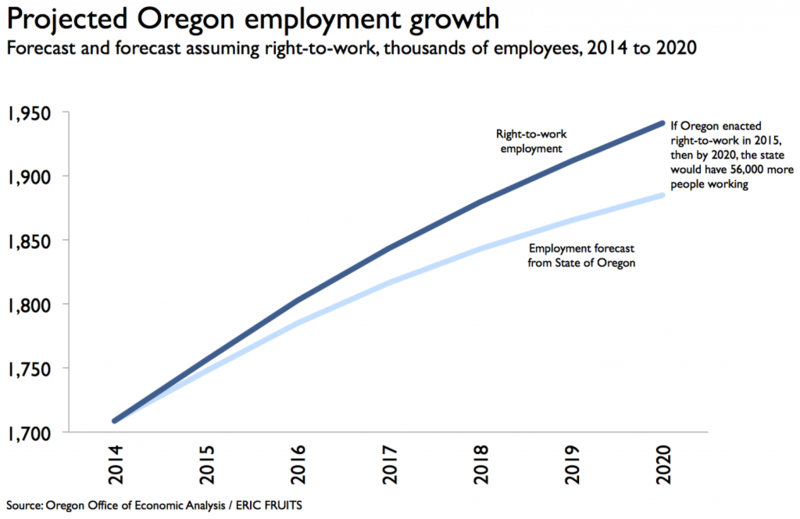 My research finds that, if Oregon were to enact right-to-work legislation, the state’s employment would grow one-half of one percent faster than it is currently projected to grow. Now, one-half of one percent does not sound like a lot. But, over time, even tiny changes in the growth rate can have large long-run impacts. For example, the figure below shows that if Oregon adopted right-to-work legislation that went into effect in 2015, then five years later the state would have 56,000 more people working than without right-to-work. Opponents of right-to-work argue that enacting a right-to-work law would gut Oregon incomes, calling it “right-to-work for less.” In fact, however, research that controls for other factors that affect wages, finds that right-to-work states have average wages that are “significantly higher” (more than six percent higher) than in non-right-to-work states. The statistical analysis I conducted shows that wage and salary growth under right-to-work would keep pace or outpace employment growth. In other words, wages would grow as fast or faster than employment. That means that, based on the experience across multiple states over many years, right-to-work laws do not lead to lower wages and are likely to improve pay over time. Right-to-work legislation may be the only economic development policy that comes at zero cost to state government. Enacting right-to-work does not require any new taxes and does not demand any new spending and would provide the state a permanent structural advantage in attracting employers and employment to the state. Originally published by Oregon Business.